The Great Lakes are one of the world's most significant water resources and are the most extensive freshwater system on earth, easily spotted as an outstanding feature on a map of the world. 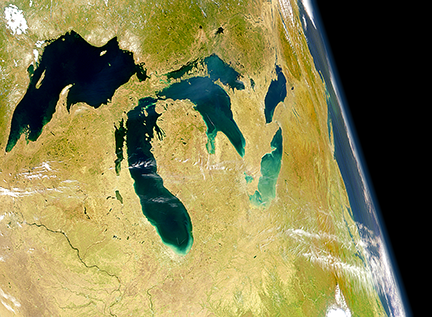 The Great Lakes contain 20% of the surface freshwater in the world—that’s about six quadrillion gallons of water! This also represents 90% of the freshwater in the United States. Only the polar ice caps contain more fresh water. The Great Lakes span more than 750 miles west to east and, if spread evenly across the continental US, they would submerge the country under about 9.5 feet of water. In addition to the Great Lakes themselves, the region is richly endowed with high quality inland lakes, expansive forests, blue ribbon trout streams, prairies, unique bogs, and the largest freshwater coastal wetlands on Earth. With nearly 10,900 miles of total shoreline, depths up to 1,333 feet, and 94,250 total square miles of surface area, it’s no surprise the North American Great Lakes are one of the world’s natural wonders. 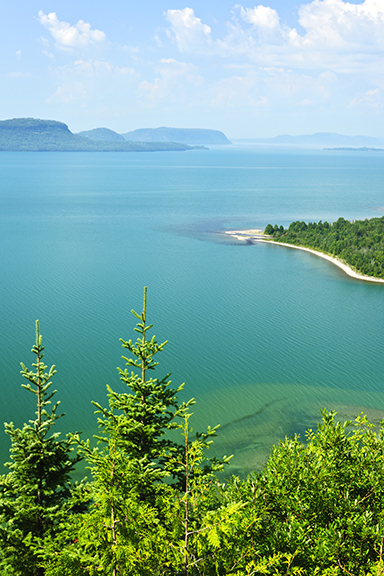 In volume, Lake Superior is the largest of the Great Lakes. It is also the deepest and coldest of the five. Superior could contain all the other Great Lakes and three more lakes the size of Lake Erie. Lake Michigan is the second-largest by volume and third-largest by area and is the only one located entirely within the United States. Lake Huron, which includes Georgian Bay, is the third-largest by volume and the second largest in area. Lake Erie is the smallest by volume, shallowest, and most biologically productive of the Great Lakes. But it is also exposed to the greatest effects from urbanization and agriculture. Lake Ontario, although slightly smaller in area, is much deeper than Lake Erie and is at a much lower elevation than the rest of the Lakes. The natural attributes of the Great Lakes ecosystem—the streams, rivers, inland lakes, forests, beaches, wetlands, and the multitude of fish and wildlife species that dwell within these landscapes – define the character of the region and the way of life for its residents and visitors. The Great Lakes provide 42 million people with drinking water and provides billions of gallons of water per day for municipal, agricultural, and industrial use. The Great Lakes economy supports agriculture, commercial and sport fisheries, shipping, recreation and tourism, and industry. The Great Lakes ecosystem contains various types of habitats allowing for more than 3,500 species of plants and animals including 250 species of fish. The Great Lakes are shared with eight U.S. states (Minnesota, Wisconsin, Illinois, Indiana, Michigan, Ohio, Pennsylvania, and New York) and has a 1,000 mile international border with Canada. The Great Lakes, in their current state, are actually one of the youngest natural features on the North American continent. On average, it takes a drop of water 191 years to cycle through Lake Superior (e.g. from entering as a drop of rain and exiting to Lake Huron via the St. Mary’s River). Lake Michigan’s retention time is 99 years. Only 1% of the water in the Great Lakes system is replenished each year; the remaining 99% was a one-time gift from the melting glaciers that created the lakes ten to fifteen thousand years ago. Dispersed throughout the Great Lakes are approximately 35,000 islands, including the largest, Manitoulin Island. Manitoulin Island's Lake Manitou is listed in the Guinness Book of World Records as the world's largest lake located on a freshwater island. Lake Ontario's Charlotte-Genesee Lighthouse is the oldest lighthouse on the U.S. side of the Great Lakes. The Great Lakes are under constant distress from a number of sources. Below are just a few of the numerous threats that impact the stability of this large, yet fragile ecosystem. 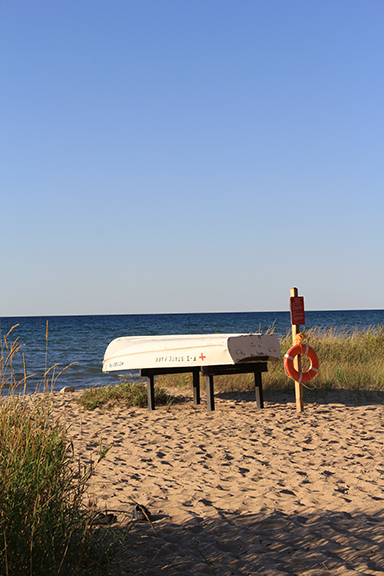 News and general information about the Great Lakes. The premier website about Great Lakes restoration.